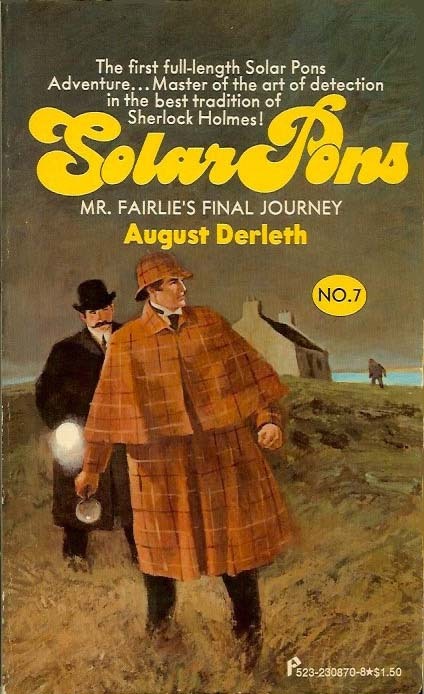 August Derleth's only full-length Solar Pons novel was Mr. Fairlie's Final Journey, first released in 1968 by Mycroft & Moran. This 1976 paperback edition was released as part of Pinnacle's Pons reprint series (No. 7). Mr. Fairlie set out for London but never reached his destination. His dead body was found en route and in the lining of his hat was the address of . . . Solar Pons! No one had any evident motive to kill Jones Fairlie–but someone did. This wasn't the first time this clever killer had slain and it wouldn't be the last–unless the master of detection, Solar Pons, could stop him. Why was Mr. Fairlie carrying Pons's address? And who was this murderer whose killing were planned with utmost care? These were the related puzzles laid before Solar Pons within hours of the discovery of Fairlie's murder . . .
Also see: The Adventures of Solar Pons (1976), The Return of Solar Pons (1975).